Gheorghe Grigore Cantacuzino (22 September 1833 - 22 March 1913), Freemason, was a Conservative Romanian politician who twice served as the Prime Minister of Romania: between 23 April 1899 and 19 July 1900 and between 4 January 1906 and 24 March 1907. He was born into the Romanian noble Cantacuzino family and was a descendant of Romanian voivods and Byzantine Emperors. The Cantacuzino Palace of Bucharest (nowadays the George Enescu Museum) and the Cantacuzino Castle of Busteni were built by him. He had five sons. 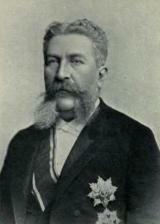 The third son, Nicolae Cantacuzino was the richest man in Romania before the land reform the followed World War I. Nicolae had three sons and two daughters-Stefan, Marga, Andronic, Senta and George Henri.